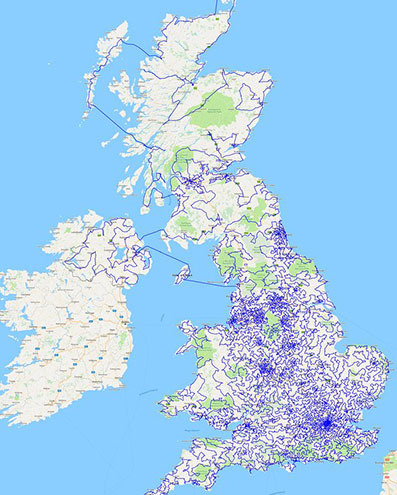 If you ever find you and your house mates want to go out drinking but can't agree on where to head, fear not- because a team of Canadian mathematicians have come up with the shortest route to complete the World's longest pub crawl, which covers 25,000 UK pubs. I can't even hack the second drink, so i'll probably sit this one out. The route is a 45,495km tour (that's longer than the circumference of the Earth) and is laid out on an interactive Google Map with more red pins than is safe to look at without getting dizzy. The route is circular so whether you're in Newcastle or Brighton you can start at any point, although the team who created it started at The Green Shutters in Portland and ended at it's neighbour, The Rodwell in Weymouth, a 6km walk away. We've calculated that if you go to every pub for one drink at £3 a pint (dreaming), you're looking at a hefty £75,000 bill- that's a footballer's night out. And to think my mates can't even track who's round it is after the second drink. The average distance between each pub is an hour, but the team who created it have said there are two ferry rides involved in the trip, although they kind-of count because you can still get beers from their extremely overpriced minibar. Phew. Intense liver damage aside, Professor William Cook from The University of Waterloo, Canada, leader of the project has said it wasn't actually set out to "improve the lot of a wandering pub aficionado" but make stops easier for the life of a travelling salesman. Boo. Reckon you could hack it?